If there is one thing that will stop you in your tracks from pursuing your dreams, it’s the pit of your stomach fear of self-doubt. Yet we are born into the world without a single slither of it. As bright-eyed beautiful babies, we go about the day knowing and thinking we are the absolute bees knees. I see this daily still in my four year old. That kid has some energy, some bravado and cares very little about what anyone else thinks or wants. As far as he can see, it’s his way or the high way and I have to admire his tenacity, he is living daily in the power of his own magic. Even when it does mean him taking it upon himself to cut his own hair or indeed swinging off the curtains. Yes both of these have happened in the last seven days (hand in face moment ensues) and as a parent, it can be challenging to not lose it and dull his magic by shouting at him, but at the same time wanting the house and my child in one piece lol. When I compare him to my eight year old who is already very conscious of what other people think. What’s cool, what’s fashionable, what or who is good looking, what is fat or what is unattractive, uttering the words of not being good enough or comparing himself to others and often being quite hard on himself. Other peoples perceptions or societal norms are placed on us and absorbed at such a young age, that by the time we are adults we have accepted it into our brains that we should always doubt ourselves, be worried about what other people think, to fear judgement and fear not ‘fitting in’. All of which causes us to lose connection with ourselves, we forget how to tune in, embarrassed to be our true selves, losing trust in ourselves, losing the connection with our own core values, needs, wants and desires, for fear of what other people think. I know I have been in that place and it feels sh!tty and pretty lonely down there. 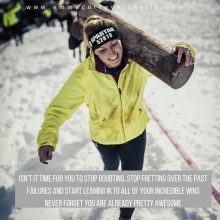 The time is now for you to stop doubting, stop fretting over the past failures and start leaning in to all of your incredible wins. Lean in to who you are, what makes you tick, what makes you smile, what lights the fire within you and get’s you excited. Yesterday, for instance, I choose to tap into my Spartan energy for my run. Wearing my t-shirt and reminding myself of all the races I have run, all the walls I have hurtled myself over, all the mud I have waded through, all the finish lines I have crossed. This in its self, allowed me to run faster, to feel the strength in my legs, to allow myself to go all in and find enjoyment through pushing myself onwards even when it hurt and that hill felt damn hard. Always look for ways to tap into your own magic. In fact I started writing this post yesterday and my own feelings of self doubt crept back in. Like it wasn’t good enough. Like it wasn’t inspiring enough or giving you guys any value or real help. So I stopped writing, and started procrastinating, I started scrolling and actually winded up feeling crappy as the feelings of guilt came back for not just getting it done. So this morning I use that. It’s ok to feel the crappy things, as long as you come back to them and work it through. I do that through my journaling and I also completed my dream life meditation that I created for my coaching guys. And I know people think you shouldn’t blow your own trumpet, but man I’m gonna. That shizzle is good!!!! Meditating and visualising what you DO want your life to look like is POWERFUL. In my vision, I am writing my blogs, emails and content with ease, because I do it with YOU in mind. It’s my mission to help more people to stop doubting themselves and start believing in your own power again like you did when you were younger, before life brought you down a peg or two. So many of you always reply saying how much my emails help. So thank you to those that take the time to reply, you keep me going and inspire me to keep reaching higher. These little steps of reminding myself of my wins, visualising what I want to create are how you stop the doubting and start creating your own little bits of magic. So I challenge you today to remind yourself of your own magic today. What are some of your greatest achievements? What did achieving that mean to you? How did it make you feel? Then harness that magic and create a vision of what you now want to see more of. Get super clear and picture yourself doing these things. Tap into the feelings and get inspired. Of course, the real magic comes when you use the energy of that vision to TAKE ACTION!!. I really hope you will do this little journal task today. If you do, I would love for you to reply and let me know what came up.